1 A None No Power Seat 1 A is a Business Class Bulkhead seat that has extra legroom. However, the proximity to the lavatory and galley may be bothersome. 1 B None No Power Seat 1 B is a Business Class Bulkhead seat that has extra legroom. However, the proximity to the lavatory and galley may be bothersome. 1 E None No Power Seat 1 E is a Business Class Bulkhead seat that has extra legroom. However, the proximity to the lavatory and galley may be bothersome. 1 F None No Power Seat 1 F is a Business Class Bulkhead seat that has extra legroom. However, the proximity to the lavatory and galley may be bothersome. 1 J None No Power Seat 1 J is a Business Class Bulkhead seat that has extra legroom. However, the proximity to the lavatory and galley may be bothersome. 1 K None No Power Seat 1 K is a Business Class Bulkhead seat that has extra legroom. However, the proximity to the lavatory and galley may be bothersome. 10 A None No Power Seat 10 A is an Economy Class Bulkhead seat that has extra legroom. However, the proximity to the lavatory and galley may be bothersome since passengers often congregate in this area during flight. The tray table is in the armrest, making the armrest immovable and slightly reducing seat width. There is no floor storage for this seat during takeoff and landing. 10 B None No Power Seat 10 B is an Economy Class Bulkhead seat that has extra legroom. However, the proximity to the lavatory and galley may be bothersome since passengers often congregate in this area during flight. The tray table is in the armrest, making the armrest immovable and slightly reducing seat width. There is no floor storage for this seat during takeoff and landing. 10 D None No Power Seat 10 D is an Economy Class Bulkhead seat that has extra legroom. However, the proximity to the lavatory and galley may be bothersome since passengers often congregate in this area during flight. The tray table is in the armrest, making the armrest immovable and slightly reducing seat width. There is no floor storage for this seat during takeoff and landing. This is a bassinet location and passengers traveling with infants may be seated in this area. 10 E None No Power Seat 10 E is an Economy Class Bulkhead seat that has extra legroom. However, the proximity to the lavatory and galley may be bothersome since passengers often congregate in this area during flight. The tray table is in the armrest, making the armrest immovable and slightly reducing seat width. There is no floor storage for this seat during takeoff and landing. This is a bassinet location and passengers traveling with infants may be seated in this area. 10 F None No Power Seat 10 F is an Economy Class Bulkhead seat that has extra legroom. However, the proximity to the lavatory and galley may be bothersome since passengers often congregate in this area during flight. The tray table is in the armrest, making the armrest immovable and slightly reducing seat width. There is no floor storage for this seat during takeoff and landing. This is a bassinet location and passengers traveling with infants may be seated in this area. 10 G None No Power Seat 10 G is an Economy Class Bulkhead seat that has extra legroom. However, the proximity to the lavatory and galley may be bothersome since passengers often congregate in this area during flight. The tray table is in the armrest, making the armrest immovable and slightly reducing seat width. There is no floor storage for this seat during takeoff and landing. This is a bassinet location and passengers traveling with infants may be seated in this area. 10 J None No Power Seat 10 J is an Economy Class Bulkhead seat that has extra legroom. However, the proximity to the lavatory and galley may be bothersome since passengers often congregate in this area during flight. The tray table is in the armrest, making the armrest immovable and slightly reducing seat width. There is no floor storage for this seat during takeoff and landing. 10 K None No Power Seat 10 K is an Economy Class Bulkhead seat that has extra legroom. However, the proximity to the lavatory and galley may be bothersome since passengers often congregate in this area during flight. The tray table is in the armrest, making the armrest immovable and slightly reducing seat width. There is no floor storage for this seat during takeoff and landing. 11 F None No Power Seat 11 F is a standard Economy Class seat. All F seats may have limited legroom and storage space underneath the seat due to the presence of an entertainment equipment box under the seat in front. 12 A None No Power Seat 12 A is a standard Economy Class seat. All A seats may have limited legroom and storage space underneath the seat due to the presence of an entertainment equipment box under the seat in front. 12 F None No Power Seat 12 F is a standard Economy Class seat. All F seats may have limited legroom and storage space underneath the seat due to the presence of an entertainment equipment box under the seat in front. 12 K None No Power Seat 12 K is a standard Economy Class seat. All K seats may have limited legroom and storage space underneath the seat due to the presence of an entertainment equipment box under the seat in front. 14 F None No Power Seat 14 F is a standard Economy Class seat. All F seats may have limited legroom and storage space underneath the seat due to the presence of an entertainment equipment box under the seat in front. 15 F None No Power Seat 15 F is a standard Economy Class seat. All F seats may have limited legroom and storage space underneath the seat due to the presence of an entertainment equipment box under the seat in front. 16 F None No Power Seat 16 F is a standard Economy Class seat. All F seats may have limited legroom and storage space underneath the seat due to the presence of an entertainment equipment box under the seat in front. 17 F None No Power Seat 17 F is a standard Economy Class seat. All F seats may have limited legroom and storage space underneath the seat due to the presence of an entertainment equipment box under the seat in front. 18 F None No Power Seat 18 F is a standard Economy Class seat. All F seats may have limited legroom and storage space underneath the seat due to the presence of an entertainment equipment box under the seat in front. 19 F None No Power Seat 19 F is a standard Economy Class seat. All F seats may have limited legroom and storage space underneath the seat due to the presence of an entertainment equipment box under the seat in front. 20 A None No Power Seat 20 A is a standard Economy Class seat. All A seats may have limited legroom and storage space underneath the seat due to the presence of an entertainment equipment box under the seat in front. 20 F None No Power Seat 20 F is a standard Economy Class seat. All F seats may have limited legroom and storage space underneath the seat due to the presence of an entertainment equipment box under the seat in front. 20 K None No Power Seat 20 K is a standard Economy Class seat. All K seats may have limited legroom and storage space underneath the seat due to the presence of an entertainment equipment box under the seat in front. 21 A None No Power Seat 21 A is a standard Economy Class seat. All A seats may have limited legroom and storage space underneath the seat due to the presence of an entertainment equipment box under the seat in front. 21 F None No Power Seat 21 F is a standard Economy Class seat. All F seats may have limited legroom and storage space underneath the seat due to the presence of an entertainment equipment box under the seat in front. 21 K None No Power Seat 21 K is a standard Economy Class seat. All K seats may have limited legroom and storage space underneath the seat due to the presence of an entertainment equipment box under the seat in front. 22 A None No Power Seat 22 A is a standard Economy Class seat. All A seats may have limited legroom and storage space underneath the seat due to the presence of an entertainment equipment box under the seat in front. 22 F None No Power Seat 22 F is a standard Economy Class seat. All F seats may have limited legroom and storage space underneath the seat due to the presence of an entertainment equipment box under the seat in front. 22 K None No Power Seat 22 K is a standard Economy Class seat. All K seats may have limited legroom and storage space underneath the seat due to the presence of an entertainment equipment box under the seat in front. 23 F None No Power Seat 23 F is a standard Economy Class seat. All F seats may have limited legroom and storage space underneath the seat due to the presence of an entertainment equipment box under the seat in front. 24 F None No Power Seat 24 F is a standard Economy Class seat. All F seats may have limited legroom and storage space underneath the seat due to the presence of an entertainment equipment box under the seat in front. 25 F None No Power Seat 25 F is a standard Economy Class seat. All F seats may have limited legroom and storage space underneath the seat due to the presence of an entertainment equipment box under the seat in front. 26 F None No Power Seat 26 F is a standard Economy Class seat. All F seats may have limited legroom and storage space underneath the seat due to the presence of an entertainment equipment box under the seat in front. 27 A None No Power Seat 27 A is an Economy Class seat that is missing a window. Also, this seat may have limited recline due to the exit door behind. All A seats may have limited legroom and storage space underneath the seat due to the presence of an entertainment equipment box under the seat in front. 27 F None No Power Seat 27 F is a standard Economy Class seat. All F seats may have limited legroom and storage space underneath the seat due to the presence of an entertainment equipment box under the seat in front. 27 K None No Power Seat 27 K is an Economy Class seat that is missing a window. Also, this seat may have limited recline due to the exit door behind. All K seats may have limited legroom and storage space underneath the seat due to the presence of an entertainment equipment box under the seat in front. 28 A None No Power Seat 28 A is an Economy Class Exit Row seat that has extra legroom. The tray table is in the armrest, making the armrest immovable and slightly reducing seat width. There is no floor storage for this seat during takeoff and landing. 28 B None No Power Seat 28 B is an Economy Class Exit Row seat that has extra legroom. The tray table is in the armrest, making the armrest immovable and slightly reducing seat width. There is no floor storage for this seat during takeoff and landing. 28 D None No Power Seat 28 D is an Economy Class Exit Row seat that has extra legroom. The tray table is in the armrest, making the armrest immovable and slightly reducing seat width. There is no floor storage for this seat during takeoff and landing. 28 E None No Power Seat 28 E is an Economy Class Exit Row seat that has extra legroom. The tray table is in the armrest, making the armrest immovable and slightly reducing seat width. There is no floor storage for this seat during takeoff and landing. 28 F None No Power Seat 28 F is an Economy Class Exit Row seat that has extra legroom. The tray table is in the armrest, making the armrest immovable and slightly reducing seat width. There is no floor storage for this seat during takeoff and landing. 28 G None No Power Seat 28 G is an Economy Class Exit Row seat that has extra legroom. The tray table is in the armrest, making the armrest immovable and slightly reducing seat width. There is no floor storage for this seat during takeoff and landing. 28 J None No Power Seat 28 J is an Economy Class Exit Row seat that has extra legroom. The tray table is in the armrest, making the armrest immovable and slightly reducing seat width. There is no floor storage for this seat during takeoff and landing. 28 K None No Power Seat 28 K is an Economy Class Exit Row seat that has extra legroom. The tray table is in the armrest, making the armrest immovable and slightly reducing seat width. There is no floor storage for this seat during takeoff and landing. 29 F None No Power Seat 29 F is a standard Economy Class seat. All F seats may have limited legroom and storage space underneath the seat due to the presence of an entertainment equipment box under the seat in front. 30 F None No Power Seat 30 F is a standard Economy Class seat. All F seats may have limited legroom and storage space underneath the seat due to the presence of an entertainment equipment box under the seat in front. 31 F None No Power Seat 31 F is a standard Economy Class seat. All F seats may have limited legroom and storage space underneath the seat due to the presence of an entertainment equipment box under the seat in front. 32 F None No Power Seat 32 F is a standard Economy Class seat. All F seats may have limited legroom and storage space underneath the seat due to the presence of an entertainment equipment box under the seat in front. 33 F None No Power Seat 33 F is a standard Economy Class seat. All F seats may have limited legroom and storage space underneath the seat due to the presence of an entertainment equipment box under the seat in front. 34 F None No Power Seat 34 F is a standard Economy Class seat. All F seats may have limited legroom and storage space underneath the seat due to the presence of an entertainment equipment box under the seat in front. 35 A None No Power Seat 35 A is a standard Economy Class seat. All A seats may have limited legroom and storage space underneath the seat due to the presence of an entertainment equipment box under the seat in front. 35 F None No Power Seat 35 F is a standard Economy Class seat. All F seats may have limited legroom and storage space underneath the seat due to the presence of an entertainment equipment box under the seat in front. 35 K None No Power Seat 35 K is a standard Economy Class seat. All K seats may have limited legroom and storage space underneath the seat due to the presence of an entertainment equipment box under the seat in front. 36 A None No Power Seat 36 A is a standard Economy Class seat. However, the seats in this area feel cramped and narrower due to the curvature of the plane. Also, the seats in this area are misaligned with those in front of them which causes neck strain when watching the personal TVs located on the back of the seats in front. All A seats may have limited legroom and storage space underneath the seat due to the presence of an entertainment equipment box under the seat in front. 36 B None No Power Seat 36 B is a standard Economy Class seat. However, the seats in this area feel cramped and narrower due to the curvature of the plane. Also, the seats in this area are misaligned with those in front of them which causes neck strain when watching the personal TVs located on the back of the seats in front. 36 D None No Power Seat 36 D is a standard Economy Class seat. However, this seat juts into aisle and may often be bumped by service carts or others passing by due to the awkward configuration transition from 4 to 3 seats. All D seats may have limited legroom and storage space underneath the seat due to the presence of an entertainment equipment box under the seat in front. 36 F None No Power Seat 36 F is a standard Economy Class seat. All F seats may have limited legroom and storage space underneath the seat due to the presence of an entertainment equipment box under the seat in front. 36 G None No Power Seat 36 G is a standard Economy Class seat. However, this seat juts into aisle and may often be bumped by service carts or others passing by due to the awkward configuration transition from 4 to 3 seats. 36 J None No Power Seat 36 J is a standard Economy Class seat. However, the seats in this area feel cramped and narrower due to the curvature of the plane. Also, the seats in this area are misaligned with those in front of them which causes neck strain when watching the personal TVs located on the back of the seats in front. 36 K None No Power Seat 36 K is a standard Economy Class seat. However, the seats in this area feel cramped and narrower due to the curvature of the plane. Also, the seats in this area are misaligned with those in front of them which causes neck strain when watching the personal TVs located on the back of the seats in front. All K seats may have limited legroom and storage space underneath the seat due to the presence of an entertainment equipment box under the seat in front. 37 A None No Power Seat 37 A is a standard Economy Class seat. However, the seats in this area feel cramped and narrower due to the curvature of the plane. Also, the seats in this area are misaligned with those in front of them which causes neck strain when watching the personal TVs located on the back of the seats in front. All A seats may have limited legroom and storage space underneath the seat due to the presence of an entertainment equipment box under the seat in front. 37 B None No Power Seat 37 B is a standard Economy Class seat. However, the seats in this area feel cramped and narrower due to the curvature of the plane. Also, the seats in this area are misaligned with those in front of them which causes neck strain when watching the personal TVs located on the back of the seats in front. 37 D None No Power Seat 37 D is a standard Economy Class seat. However, this seat may have restricted legroom due to the misaligned seats and the awkward configuration transition from 4 to 3 seats. While you have some extra storage space, you'll have to maneuver your legs around the extra seat anchors. The tray table is in the armrest, making the armrests immovable and slightly reducing seat width. All D seats may have limited legroom and storage space underneath the seat due to the presence of an entertainment equipment box under the seat in front. 37 E None No Power Seat 37 E is a standard Economy Class seat. However, this seat may have restricted legroom due to the misaligned seats and the awkward configuration transition from 4 to 3 seats. While you have some extra storage space, you'll have to maneuver your legs around the extra seat anchors. The tray table is in the armrest, making the armrests immovable and slightly reducing seat width. 37 F None No Power Seat 37 F is a standard Economy Class seat. However, this seat may have restricted legroom due to the misaligned seats and the awkward configuration transition from 4 to 3 seats. While you have some extra storage space, you'll have to maneuver your legs around the extra seat anchors. The tray table is in the armrest, making the armrests immovable and slightly reducing seat width. All F seats may have limited legroom and storage space underneath the seat due to the presence of an entertainment equipment box under the seat in front. 37 J None No Power Seat 37 J is a standard Economy Class seat. However, the seats in this area feel cramped and narrower due to the curvature of the plane. Also, the seats in this area are misaligned with those in front of them which causes neck strain when watching the personal TVs located on the back of the seats in front. 37 K None No Power Seat 37 K is a standard Economy Class seat. However, the seats in this area feel cramped and narrower due to the curvature of the plane. Also, the seats in this area are misaligned with those in front of them which causes neck strain when watching the personal TVs located on the back of the seats in front. All K seats may have limited legroom and storage space underneath the seat due to the presence of an entertainment equipment box under the seat in front. 38 A None No Power Seat 38 A is a standard Economy Class seat. However, the seats in this area feel cramped and narrower due to the curvature of the plane. Also, the seats in this area are misaligned with those in front of them which causes neck strain when watching the personal TVs located on the back of the seats in front. All A seats may have limited legroom and storage space underneath the seat due to the presence of an entertainment equipment box under the seat in front. 38 B None No Power Seat 38 B is a standard Economy Class seat. However, the seats in this area feel cramped and narrower due to the curvature of the plane. Also, the seats in this area are misaligned with those in front of them which causes neck strain when watching the personal TVs located on the back of the seats in front. 38 F None No Power Seat 38 F is a standard Economy Class seat. All F seats may have limited legroom and storage space underneath the seat due to the presence of an entertainment equipment box under the seat in front. 38 J None No Power Seat 38 J is a standard Economy Class seat. However, the seats in this area feel cramped and narrower due to the curvature of the plane. Also, the seats in this area are misaligned with those in front of them which causes neck strain when watching the personal TVs located on the back of the seats in front. 38 K None No Power Seat 38 K is a standard Economy Class seat. However, the seats in this area feel cramped and narrower due to the curvature of the plane. Also, the seats in this area are misaligned with those in front of them which causes neck strain when watching the personal TVs located on the back of the seats in front. All K seats may have limited legroom and storage space underneath the seat due to the presence of an entertainment equipment box under the seat in front. 39 A None No Power Seat 39 A is a standard Economy Class seat. However, the seats in this area feel cramped and narrower due to the curvature of the plane. Also, the seats in this area are misaligned with those in front of them which causes neck strain when watching the personal TVs located on the back of the seats in front. All A seats may have limited legroom and storage space underneath the seat due to the presence of an entertainment equipment box under the seat in front. 39 B None No Power Seat 39 B is a standard Economy Class seat. However, the seats in this area feel cramped and narrower due to the curvature of the plane. Also, the seats in this area are misaligned with those in front of them which causes neck strain when watching the personal TVs located on the back of the seats in front. 39 D None No Power Seat 39 D is a standard Economy Class seat. However, the proximity to the lavatory may be bothersome. All D seats may have limited legroom and storage space underneath the seat due to the presence of an entertainment equipment box under the seat in front. 39 F None No Power Seat 39 F is a standard Economy Class seat. However, the proximity to the lavatory may be bothersome. All F seats may have limited legroom and storage space underneath the seat due to the presence of an entertainment equipment box under the seat in front. 39 J None No Power Seat 39 J is a standard Economy Class seat. However, the seats in this area feel cramped and narrower due to the curvature of the plane. Also, the seats in this area are misaligned with those in front of them which causes neck strain when watching the personal TVs located on the back of the seats in front. 39 K None No Power Seat 39 K is a standard Economy Class seat. However, the seats in this area feel cramped and narrower due to the curvature of the plane. Also, the seats in this area are misaligned with those in front of them which causes neck strain when watching the personal TVs located on the back of the seats in front. All K seats may have limited legroom and storage space underneath the seat due to the presence of an entertainment equipment box under the seat in front. 40 A None No Power Seat 40 A is an Economy Class seat located in the last row of the plane and may have limited recline. The proximity to the lavatory and galley may be bothersome. All A seats may have limited legroom and storage space underneath the seat due to the presence of an entertainment equipment box under the seat in front. 40 B None No Power Seat 40 B is an Economy Class seat located in the last row of the plane and may have limited recline. The proximity to the lavatory and galley may be bothersome. 40 D None No Power Seat 40 D is an Economy Class seat located in the last row of the plane and may have limited recline. The proximity to the lavatory and galley may be bothersome. All D seats may have limited legroom and storage space underneath the seat due to the presence of an entertainment equipment box under the seat in front. 40 E None No Power Seat 40 E is an Economy Class seat located in the last row of the plane and may have limited recline. The proximity to the lavatory and galley may be bothersome. 40 F None No Power Seat 40 F is an Economy Class seat located in the last row of the plane and may have limited recline. The proximity to the lavatory and galley may be bothersome. All F seats may have limited legroom and storage space underneath the seat due to the presence of an entertainment equipment box under the seat in front. 40 J None No Power Seat 40 J is an Economy Class seat located in the last row of the plane and may have limited recline. The proximity to the lavatory and galley may be bothersome. 40 K None No Power Seat 40 K is an Economy Class seat located in the last row of the plane and may have limited recline. The proximity to the lavatory and galley may be bothersome. All K seats may have limited legroom and storage space underneath the seat due to the presence of an entertainment equipment box under the seat in front. Business Class features AC power ports. There is no power in Economy. There are three different versions of the A330-200 operating in the fleet. For this Version, Business Class is found from rows 1 to 4 and Economy Class begins at row 10, ending at row 40. This aircraft is used for a variety of long-haul destinations and it flies with 24 seats of Business Class and 236 seats of Economy Class. 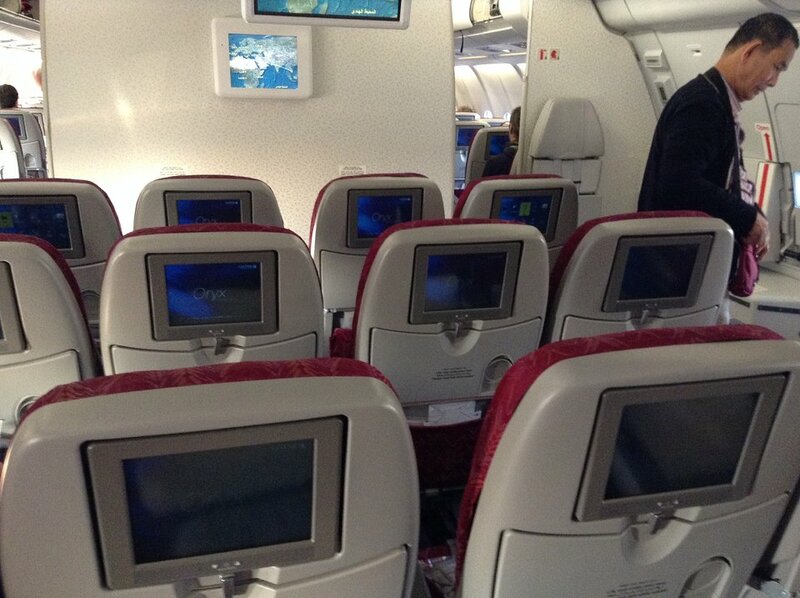 In the Economy Class, all A, D, F and K seats on the A330-200s may have limited legroom and storage space underneath the seat due to the presence of an entertainment equipment box under the seat in front. 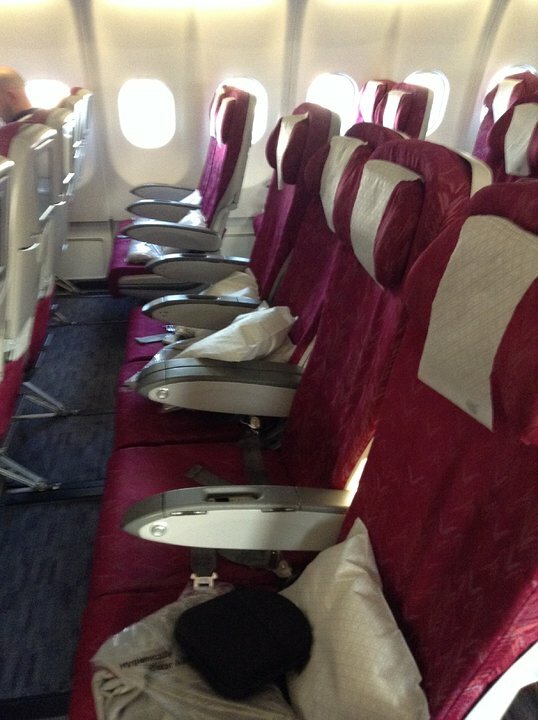 Flew MAN to DOH which meant 7 hours in one of these business class seats. It is almost a lie flat, but not quite. It's not enough to stop you sleeping but does feel a bit odd. More worrisome was the foot space in the ottoman in bed mode. I'm a size 9 and struggled with my feet the whole flight. It's also not the longest lie flat seat, at 5'11" I'm not a giant but I filled the bed in lie flat mode. Otherwise it was generally comfortable and easy to adjust despite being a bit limited in the range of movements it could do. 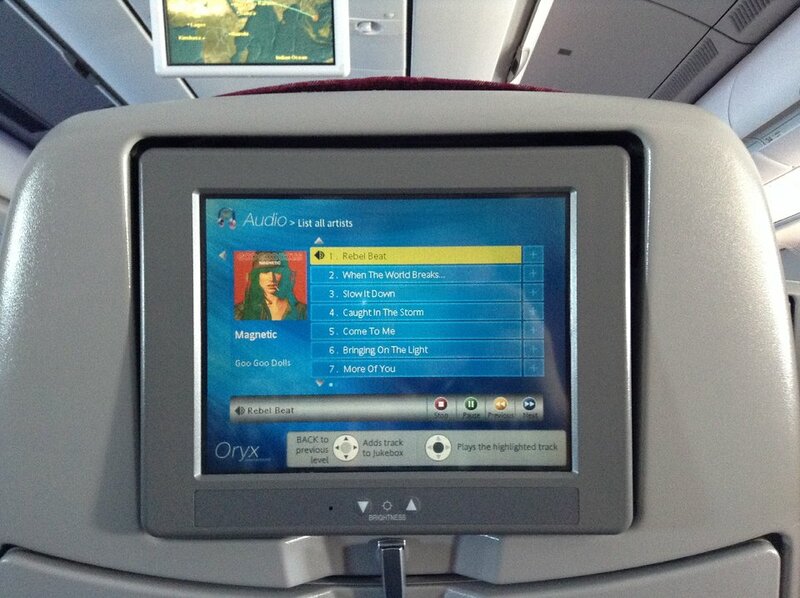 The AV system was quite good, nice big touch screen which was pretty responsive. Lighting and amenities were acceptable. This is the worst business class seat one could imagine. It is narrow and cramped and it gives a claustrophobic feel. Avoid this chair and this plane because it is an old fashioned business class product. 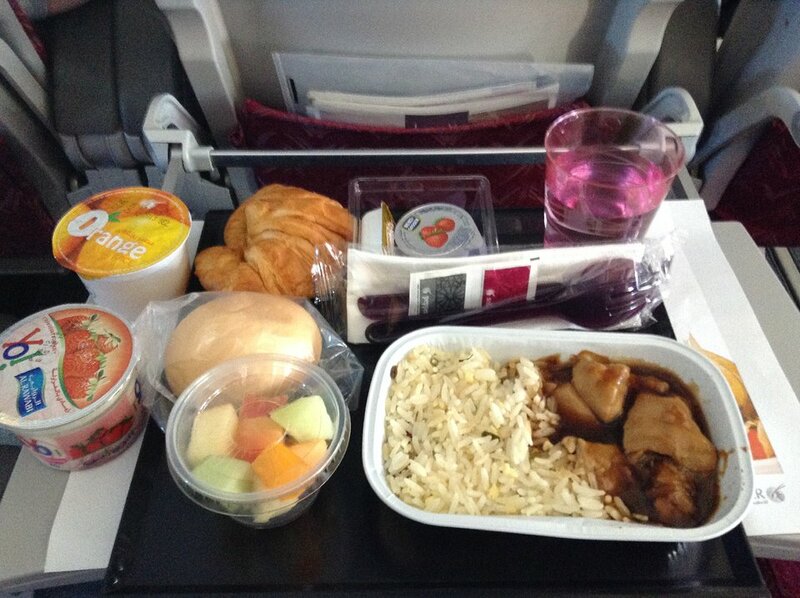 Unbelievable that the acclaimed best business class airliner is flying with this crap! Qatar Airways flies 4 versions of Airbus A330-200 (332) V1.